I'm totally in love with The Daily Goodie Box. It's a free sampling program that sends full size and sample products. 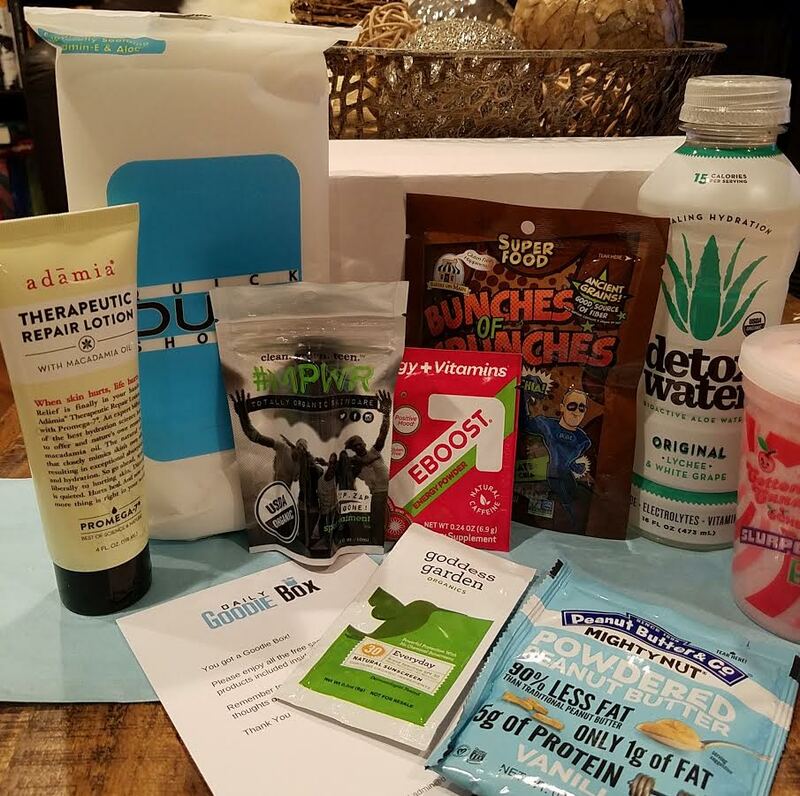 My favorite part about the whole program, besides the fact that it's completely free and they send awesome items, is the fact that you don't have to do anything to get your samples. There's no scrambling out of bed at an ungodly hour to snag some samples before everyone else does. I *love* that. While there's no guarantee you'll get a box, you don't have to stress out about annnyyything! The only thing you have to do is make an account and fill out your profile. Filling out your profile means you'll get samples that fit you and your household. So if you don't have a baby you're not going to get diaper wipes and if you have a husband you may get items for him to try. That kind of thing. It's actually a great system and means you'll get things you are most likely to use and enjoy. d) Do you show interest in this months products by viewing them from the 'Products' page? e) Do you actively engage in our social media pages? f) Is your shipping information up to date? Once you get a box, you need to try everything and then report your thoughts back via your profile. Easy peasy! 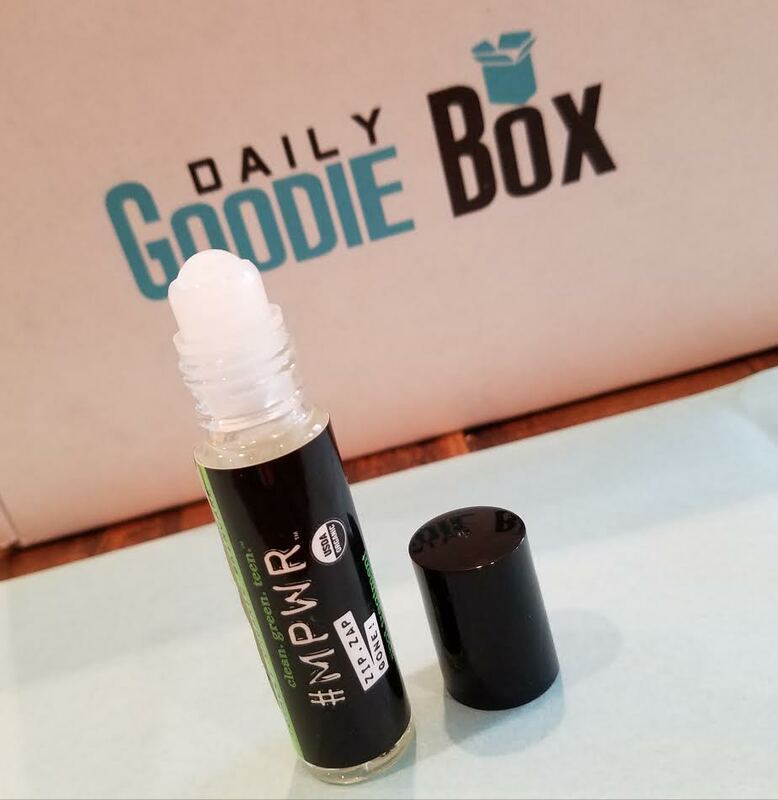 #MPWR Skincare - Zip, Zap, Gone! Spot Treatment Sticks- This is a rollerball for getting rid of zits. 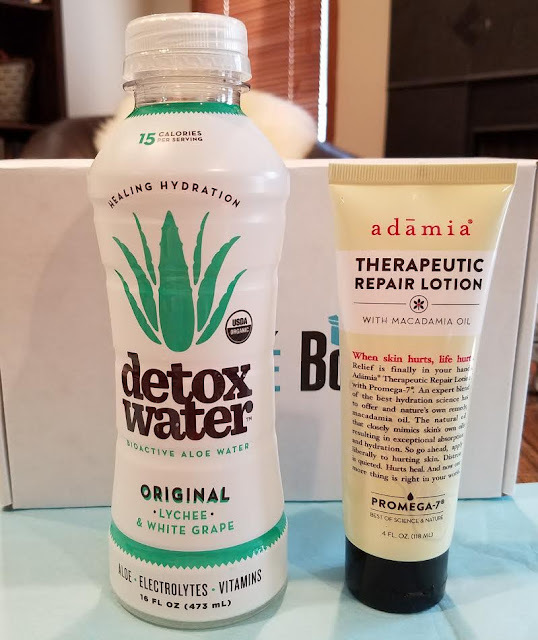 I received something similar in one of my natural beauty boxes and it works great. My husband has been stealing it, though. Lucky for me, this one is suitably manly looking and I gave it to him. He's already used it and said it helped. It's made with organic ingredients and has witch hazel, aloe, green tea extract and a bunch of other essential oils. It's geared toward teens but don't let that stop you from trying it. 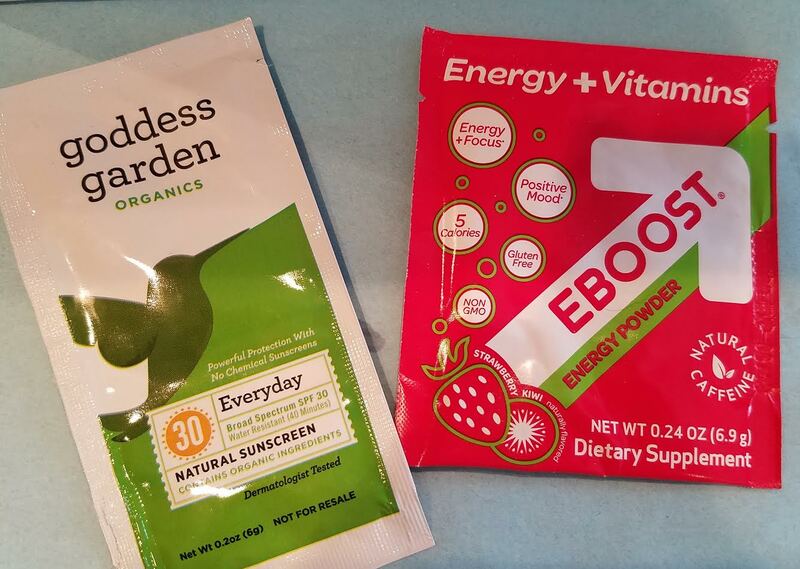 Goddess Garden - Everyday Natural Sunscreen Lotion- I prefer sunscreens with zinc oxide and titanium dioxide so I tried this. It's thin and easy to spread but it does leave you white which is pretty normal for the type. Unfortunately, it has lavender essential oil in it which I'm allergic to. And it's overpowering. EBOOST - Strawberry Kiwi Energy Powder- We've been hitting up the gym regularly since February. I've been weightlifting for the first time in my life and I'm LOVING it. Squats are my favorite and just today I hit a new personal record of 155lbs! That's 120% of my body weight! Anyway, because of all this I've been trying new kinds of energy booster powders and pills. Honestly? I can't really tell a difference unless there's niacin in there. This powder is a little different. It has L-Tyrosine and 5-HTP in it. Both of these are amino acids related to mood boosting and relieving stress. Interesting. Another thing I might have to pick up more of so I can test more thoroughly! One isn't enough! It tastes fine, too. I'm not a big fan of Strawberry Kiwi normally but this was definitely drinkable. Detox Water - Lychee & White Grape- This is water mixed with citrus extracts and aloe gel flakes. It's supposed to be good for your digestive system since aloe gel is anti-inflammatory, anti-bacterial and helps aid wound repair in it's awesomeness. I do love aloe for my skin for all those reasons but I've never considered drinking it. I putzed around the internet and discovered there's a lot of information about this, including a few studies that most healthnut websites tend to ignore. So here's what I'm gonna say... If it's the "gel" go for it. If not, move on. And don't chop up your plant and mix it in your smoothie without removing the skin and yellow layer just under it-- those parts are possibly carcinogenic. You just want the gel, that's it. Since my husband has struggled with gastroenteritis in the past, anything that helps the gut is welcome around here. This is low sugar, low calorie and organic. It's made with aloe gel flakes (key!). It tastes like grape which makes sense since that's the flavor. Hah! My husband drank the rest. I'm still waiting to hear back about whether it affected his guts or not. I think I may have to pick up some more to give it a long term test. Adāmia - Therapeutic Repair Lotion- This is a gloriously creamy lotion made with macadamia seed oil, aloe leaf juice and vitamin E. It is fragrance free and leaves my skin so smooth. It's not sticky or greasy. I really like it and I'm not usually a fan of body lotions. They tend to be too thick or leave me feeling like an oil slick. Not this! It sinks in quickly and I'm so soft! Slurpee - Slurpee Cotton Candy - I never met a cotton candy I didn't like. Or didn't want more of. I did want more of this once it was gone. I ate half of it before I even took the photo. Whoops. Yes, it's candy. Yes, it's tasty. No, it doesn't taste like cough syrup. Now I want more. Peanut Butter & Co - Mighty Nut Powdered Peanut Butter- If you've never tried powdered peanut butter, you probably should. This is something I discovered during my quest for weight loss a few years ago. I haven't used it in years and getting this reminded me of how tasty it makes protein shakes. So I use ice, my Optimum Nutrition Double Chocolate, a little almond milk, a banana and two tablespoons of this. Yum!!! Also awesome is the fact that this little packet has enough for two shakes! I need to get more of this. That peanut butter flavor is so nice. 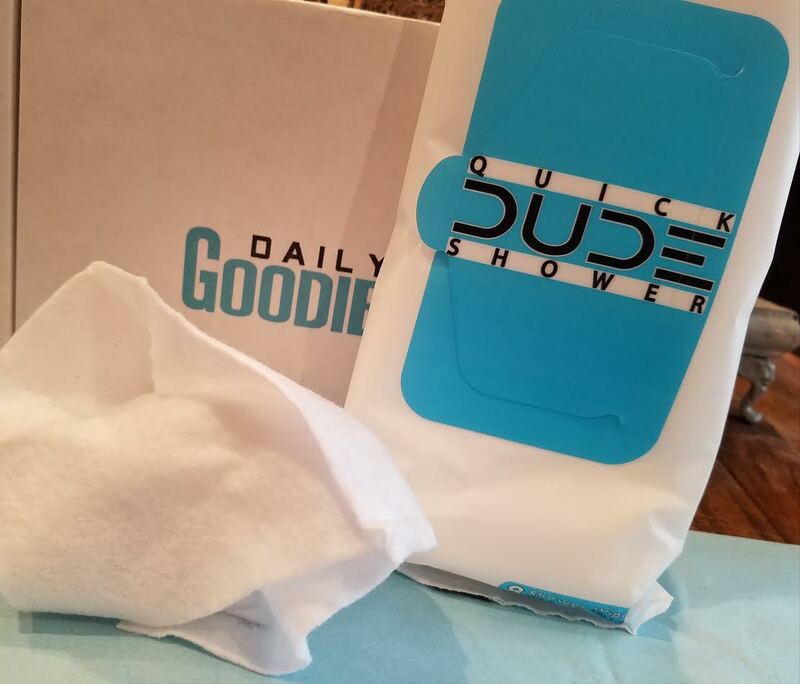 DudeProducts - Quick DUDE Shower Wipes- These are wonderful! So they're for guys to use after the gym. I would imagine that it's the best thing ever when you're one who works out on their lunch break. These are SUPER thick, basically washcloths. I feel like I should rinse it out and reuse it for something else, that's how thick they are. You can wash your entire body off with one very easily. The smell is great, subtle but clean. 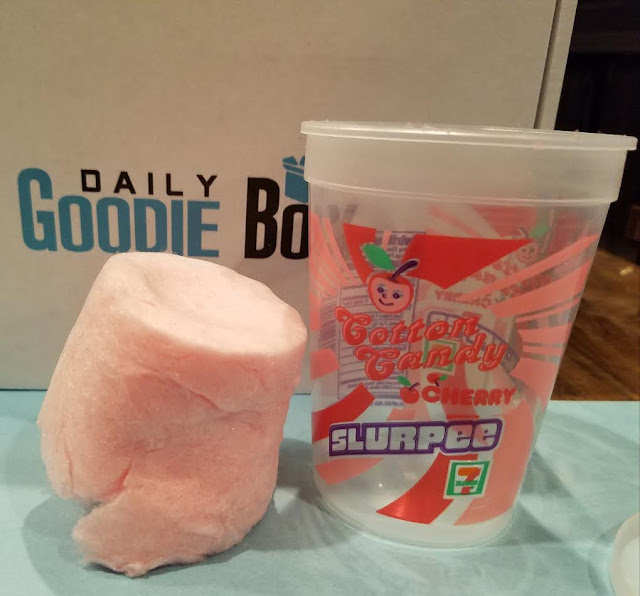 I used one after working out to test it for this review and was impressed. I'm saving them for our camping trip now. So much easier than a solar shower. And if you're a man and your hair is short enough, it'll probably take care of the hair, too. Hooked! I have to admit that this is one of the best sampling/product review programs I've ever been a part of. It's so easy! I like how they send products based on your profile so you're not getting some weird thing you'll never use, too. If it means I miss out on a box or two, I'm totally fine with that. Plus, there's something fun about getting that random email. I'd completely forgotten about it then BOOM! Surprises like that are always a good thing, right? So sign up to get on the list for a Daily Goodie Box here. I don't know how long it'll take but I can pretty much guarantee you'll have fun when you do get one! 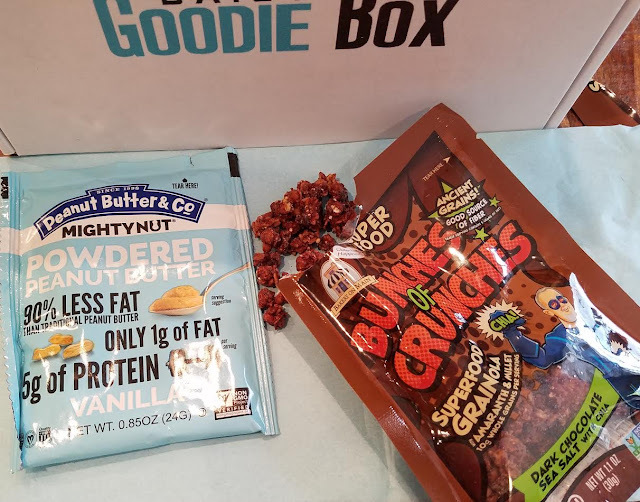 Have you received a Goodie Box? Did you find anything wonderful in it? *I received this box free of charge (program is completely free). All opinions are mine. I'm glad you're back I was worried for a minute! I wish they did boxes like this over here. P.s I revamped my blog and I blog mostly about UK subscription boxes now, if there are any you've been intrigued about let me know as I've been on a real subscribing spree lately haha.